Welcome to the 46th Metamorphosis Monday! Hope you had a wonderful Thanksgiving! I’ve been out of state visiting my son and his sweetie. It was a whirlwind trip and so much fun. My son gave me a tour of the law school he’s attending, as well as a tour of the wonderful historic building where he works with a local firm. We did a little shopping on Black Friday and went to see A Christmas Carol on Saturday. It was a great trip and I’m so looking forward to when they come home to Georgia for Christmas. I have a fun metamorphosis to share with you today. A while back, while out antiquing with a friend, I came across something that was sooooo cute, I knew I had to share it with you! Here’s your first little peek. Have you figured out what it is? Okay, I won’t torture you any longer. I have to warn you though, it may send youu on a mad hunt looking for old, abandoned windows so you can make one for yourself. This would be great to decorate for holidays like they have done here, or to decorate throughout the year for the seasons. If you collect the Dept. 56 lit houses, this would be a wonderful place to build a small village or vignette. I took pics from different angles, so you could see how it’s constructed. The first few pics of this post show some close-ups of the details. 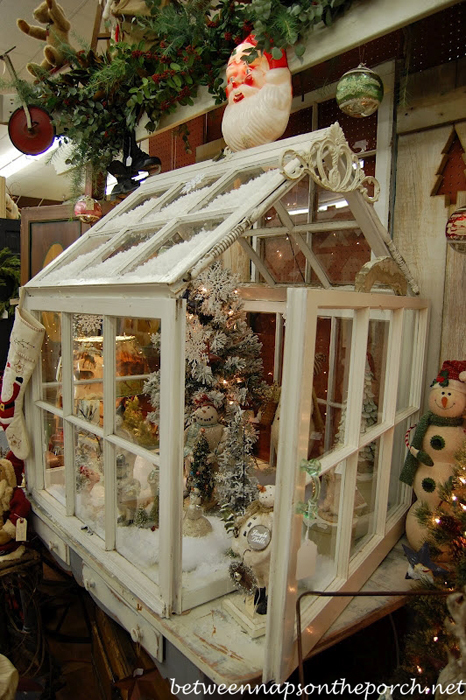 Wouldn’t it be really cute in a sun room, on a front porch or a screened-in porch? Really, I could see using it in almost any room. I didn’t buy it since it was well over $300, but I took lots of pics so I could remember how it was constructed and so I could share it with you. I think we could make one of these if we put our minds to it! So, don’t throw out those old windows when you get your new energy efficient ones. 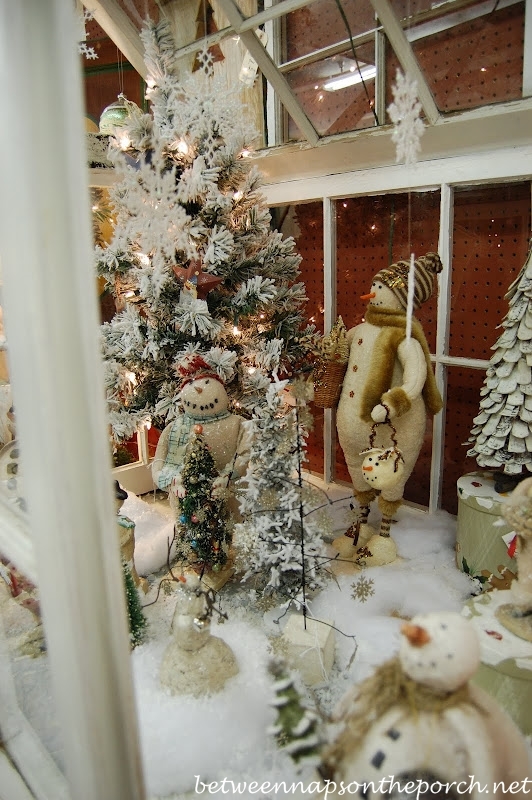 They will make a wonderful glass house or greenhouse and a great spot to display your collectibles and create wonderful vignettes. Update: This greenhouse was still there in April 2010 and it was decorated for Easter. 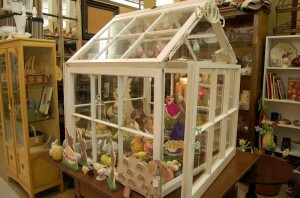 To see pictures of how it looked at Easter, visit here: Make a Greenhouse from Discarded Windows. Oh my gosh..this is one of the mot beautiful things I have seen. You did an excellent job. I know you don't know me, but you forgot to send me a gift on my birthday…I will just take this!!! I am teasing of course, but this is just beautiful. 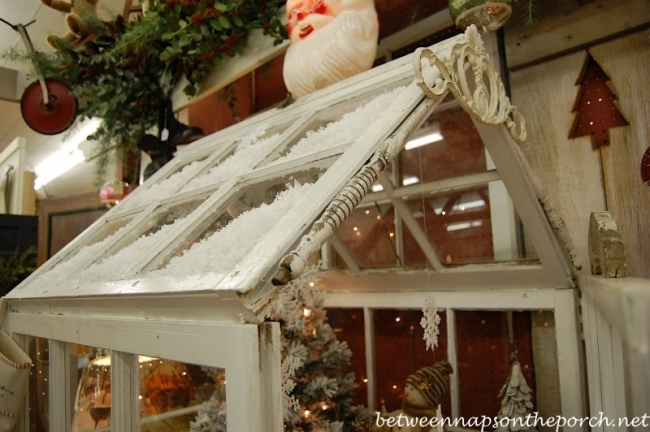 Okay, I have a white framed mini greenhouse like that. It is missing the windows but now you've got my creative juices really going! Wow, how cute is that? Ohh I love it! I can picture that with goodies in it for summertime. I'm glad you had a nice trip. Oh I like that very much. Perfect tabletop size too. So many themes it could be used for. Looks easy enough to make as well. Wow! That is truly wonderful. Pricey but adorable. My favorite antique shop at the lake has one of these. The price is $250. 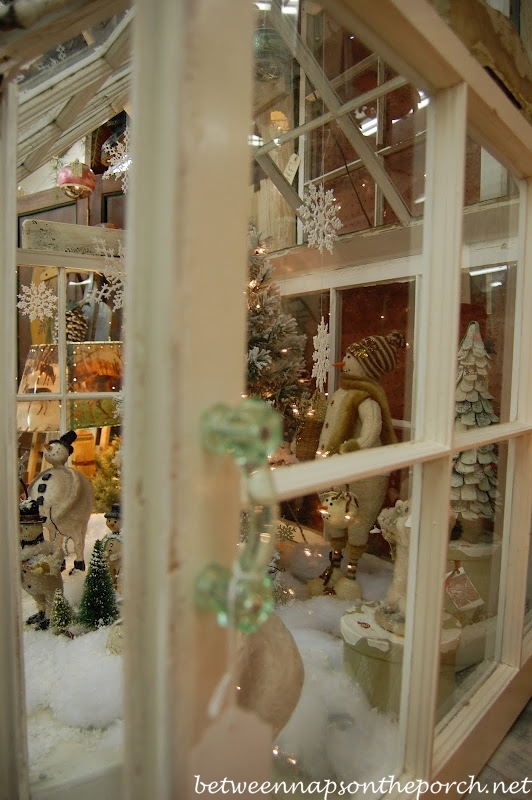 Our friend Greg at All About Home has all kinds of windows. Perhaps I can try doing this, after Christmas. These are so cute. I was thinking for our back porch. I love how this one is done up. Darling…absolutely adorable. I have many old windows that I've rescued from the trash over the years. I was going to use them as exterior tabletops but now I'm rethinking that option. First time to your site. WoW! I love the little green house. I have two old windows, so that is a start! I absolutely love this idea! I love that! Is it made of old windows? OOOOOOOH, Susan! I want one!!! My hubby is going to want to strangle you. Another project for him…LOL. I won't tell him the idea came from BNOTP or he'll try to block your site. I'll have to give all my sisters the heads up to keep an eye out for old windows now. I'm glad you got home to GA safely, too. Love our creation! Saw something like that not too long ago. I am definately inspired! Thanks and Hugs from Conroe, TX! What a beautiful piece, Susan! Yes, I could see it on "someone's" porch. ; ) I do love the way it is decorated for Christmas. Glad to hear you had such a lovely visit with your son. What a great way to use old windows. I can see a scene set for each season. Fun!! I just love those! I have nowhere to put one, but still, they are beyond adorable! makes the cutest ones I have ever seen! she even adds broken china mosaic to them! Take a tour of her creations!! Love it!! 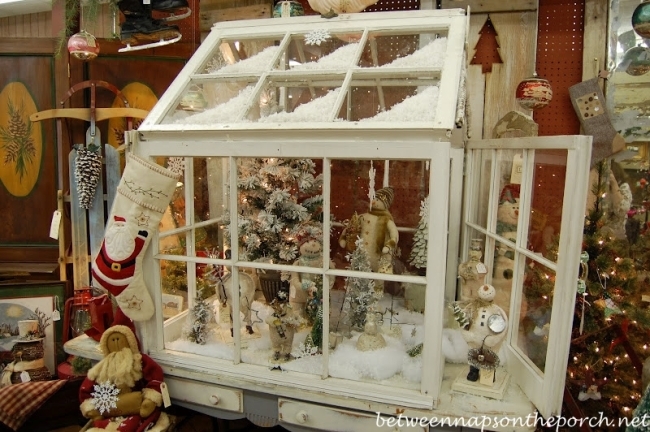 I tried to figure out how to add artificial snow to one of my birdcages this year, but it was going to be a big mess, so gave up. Thanks for sharing your trip with us! Isn't that the cutest thing? I have to say, I'm really glad it wasn't yours…I was going to feel so insecure after posting my itty bitty idea for my first Met Monday. I can't wait to see which blogger produces the first one of these! Absolutely adorable. You are right, with the right materials this could easily be duplicated. And I think it would be much more fun to make it myself. That little window house is just so cute! Oh Susan! This is SO gorgeous!! I think I would have to leave it out all year! I couldn't bear to put it away! What a wonderful transformation and a fabulous idea. The possibilities are endless. You're so creative! My transformation today is actually a future transformation done with an art glass ornament. I am doing a giveaway with lovely ornaments and offering readers a special discount with The Artful Home. Happy holidays from me to you. Susan, I love the house made of old windows! It looks like it might be difficult to construct unless you had a husband who does woodworking. Pa's great at lots of things but carpentry is not his strong suit! I can think of so many cute ways to use it, but I'd need to hire a handyman to built it! Now you tell me!! After we did throw away our old windows. Man is that awesome!! My dear hubby built me a little conservatory identical to this one this past summer. I never thought to use it for Christmas. Thanks for sharing this great idea. Oh my gosh, sooooo pretty! That is so beautiful. It makes me wish I could just jump in there a walk around for a while. Thanks for hosting. I love all the great ideas I get. I wish I was posting a holiday metamorphosis. I am to consumed with our new renovation at the beach house. Your blog (and the links) are definitely getting me in the holiday spirit. That is a gorgeous, gorgeous display area! Now I'm pondering the work against the crash when I build one and my son and his basset hound knock it over. ok, now I have a new goal in life own/make one of those. how cute is that green house! This was my first time for metamorphosis Monday! I cant believe how many people already have posted! This is exciting! Thanks for letting us share our makeovers! Beautiful! I'm sure you could whip one of these beauties up with some old windows. Today I'm sharing my 50-year-old doll that was just restored! I can't believe I'm number 90 on your list, and it's not even Monday yet! LOL! Thanks for sharing such a wonderful idea!!! Your photography was great to capture the details of the construction. I really want to try this adorable little house. The search is on for some old windows!!! I love it!!!!! Susan, that is about as cute as can be! I love the snowmen in it. I wonder who makes those snowmen? I like the one who has coal for a mouth. If only I could find him online. SO cute. I have some old windows, but I don't have enough to construct this… but I do LOVE it! I'm not so sure that $300 isn't an okay price for all of that cuteness. Are the snowmen included in that, too? I think you need it for your porch, Susan. I have always wanted to make one of those. I even have instructions in an old magazine. I loved it filled for christmas. 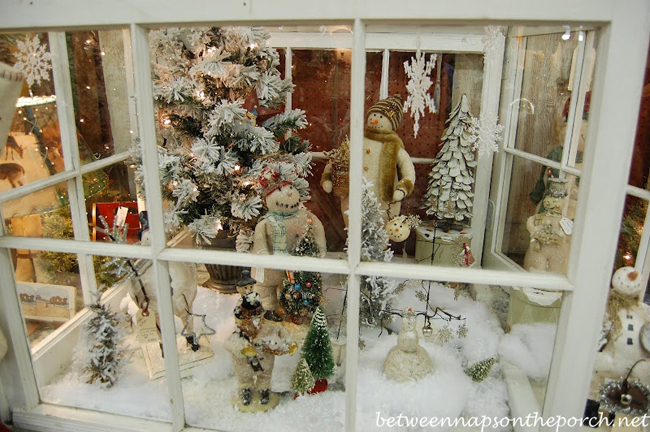 Absolutely gorgeous and magical with the snowmen in it. I would love to own something like that…the possibilities are endless! 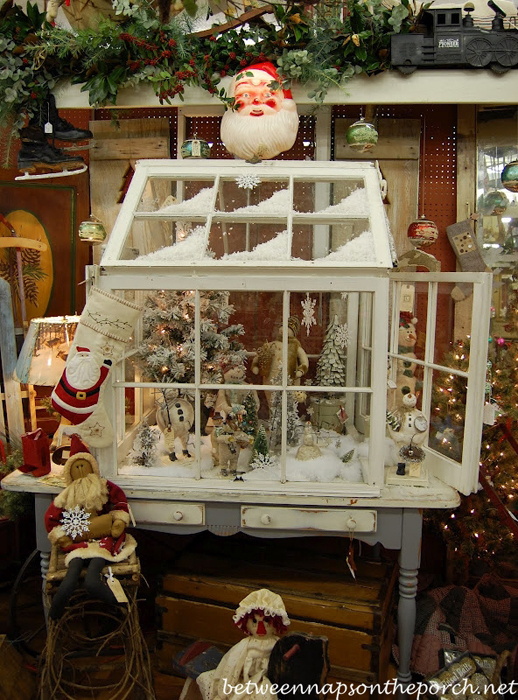 That is just the cutest thing I have ever seen made from old windows. I too can see many uses for it, but it is just so precious the way it is. Thanks for taking the time to photo it and share. 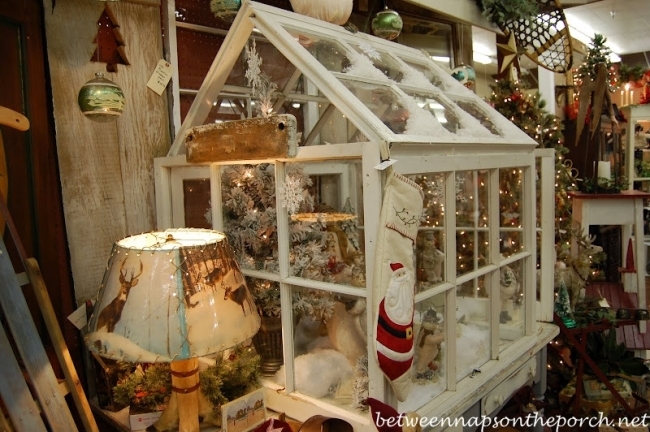 What a precious greenhouse and how cute to decorate it for Christmas like that! I would love to make one like this and have several pictures of others in my inspiration file! Now I have 1 more! That is truly an adorable little Greenhouse. 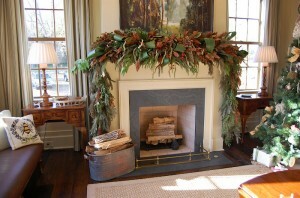 I love it all decorated like this for winter, but you are so right, it could be used in many ways. Did you get it? Or are you waiting for some old paneled windows to come into your life. Are you putting up a Dept 56 village this year? Wow, what you have achieved is impressive. Im so excited to be able to celebrate with you once again on a metamorphosis! I love your green houses– but then everything you do is wonderful! 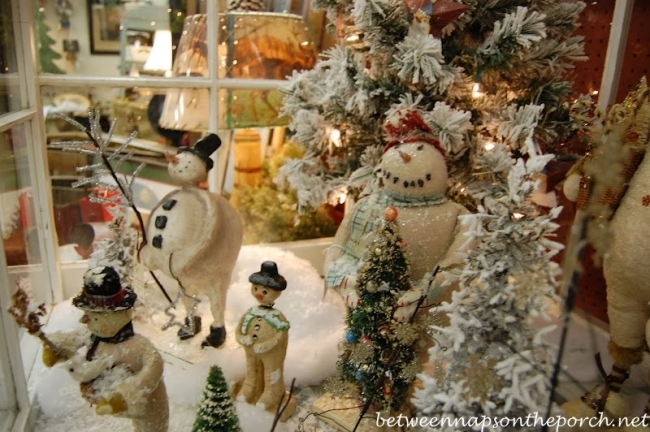 Scenes with snowmen always melt your heart! What a great use for an observatory. Now I'm going to have to find me one! So pretty. love, Love, LOVE THIS! It is adorable and I so want one! this is theeeee cutest thing i have ever seen!! and guess what, I have old windows!!! Now to fine the time. thanks for sharing and for hosting each week. This might be my first time here, but it is such a tiny thing…. Just amazing, thanks so much for taking such wonderful pictures of the construction. Now we all can have one!!! What fun!!! What a wonderful idea. I love the beautiful pictures that you took too, Susan. Many thanks for hosting Met Monday again. You don't know how much I love coming to visit you and all of the other talented bloggers on these special party days! Ditto Rett's comments; my Hubby will try to block your blog 🙂 We have old windows just sitting in our mill. I'll make lasagna before I ask. I have begun my 3 weeks of crafts, gifts and decor series. Yes Susan, I did scream, I love old windows and that is just the most creative, fun idea! Thank-you for posting this darling idea! December Blessings to you, Susan! May you have a most wonderful time of the year as we decorate and celebrate the LORD Jesus's Birthday. White cake for sure. Susan, this past year I began to learn how to blog and it has become a passion with me! I luvs it I do!!! I was so fortunate to come across your site earlier this year and began to follow. This has been such a delightful place to visit and see so many wonderful ideas. So adorable, what a neat greenhouse! Happy Met Monday, thank you for hosting this fun event! What a lovely idea. I used to have a number of those old windows, I kept them around for years thinking I would do something with them and finally got rid of them — so sad, this was a beautiful way to make something so interesting! How darling is that snow house? I'd love to see yours when it's finished. I have a few old windows myself, this is brilliant! I'll be saving them up to make my own little greenhouse. I absolutely adore the old windows made into a "special" room. 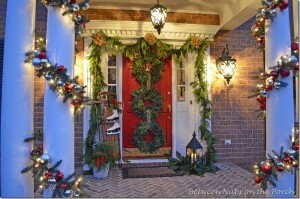 It is cute as can be for Christmas, but I see lots of possibilities all year! I love this! What a great creation with old windows!! So many ways to use it. Thanks for sharing. It looks like Mr. Linky is not working. 🙁 It was working all day until around 6:30 PM. I've sent in a help ticket so hopefully whatever isn't working will be working again, soon. I'm guessing he is having server issues…that's normally what it is when it goes down. Stay tuned…hopefully the links will be back soon. Great. Now I want one of those. My DH is going to send you a nasty email…oh, wait, no he won't because he has NO CLUE how to send an email, poor darling. But he does know how to build things, and now I know what to tell him I want for Christmas besides clothes. That should make him breathe a sigh of relief-he'd much rather build than shop for clothes! Thanks for sharing-love, your favorite stalker!! Susan, so happy to hear you were with your son for the holidays. Sounds like you had a delightful visit. Love the little window house. We just replaced our windows a year ago. And no, we didn't keep them. They went to Habitat for Humanity. Knowing me I'd never get around to making something like this, but it is a great idea. oh.my.goodness!!!! I am in love with that!!!! I've got to go un-earth my old windows now! Oh my goodness. What a great display. Makes me want to go out to shop for old windows. Why cant I get my hands on OLD WINDOWS? I have so many plans for them. That is just BEAUTIFUL! I dont know if I miss Mr Mclinky, but I linked to the post! Thanks Susan! That is so cute, perfect for your porch. I love how they presented it..just adorable..
Glad you got to see your son for the holiday. Enjoy seeing him now..once he starts work, there is never time. My ds and dil are both attnys..he is ALWAYS working! She is too, but home now with 4 little ones..which is a lot of work! This is great! I can just see one used differently for the seasons. Thanks for all the pics with the details. Glad you had a wonderful trip! How utterly charming! As I was looking at the pictures, I kept thinking, "How much did that cost?" Really, I'm not surprised that it was so expensive. But an enterprising do-it-yourselfer could probably come up with a reasonable facsimile! Susan, this is beautiful. I love Christmas. Hello Susan. OMG!!!!! 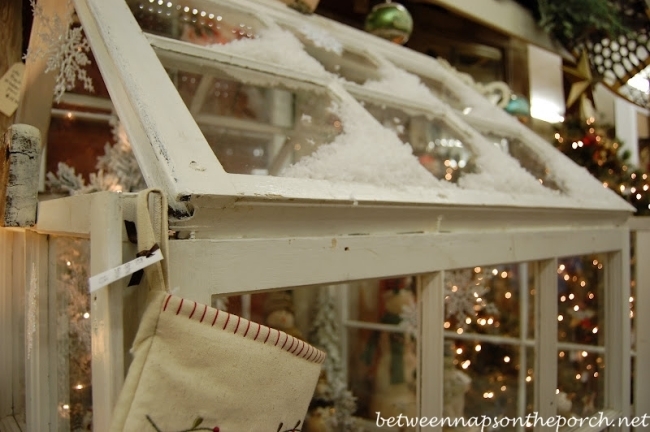 I so love that… I have seen those before,, I am always on the look out for old windows.. I am happy to hear you had a wonderful time with your son and his sweetie.. We just got back from seeing ours back home,, loved it… but so far behind,, on everything… have a great week. THAT made my heart go pitter pat! It's just delightful! My friend has one that she uses outside as a mini greenhouse! I love that! It's gorgeous. I hope you make one and post it! That white window wardian case is adorable! I've been trying to find the perfect (affordable) wardian case for some time with no luck. I'm so glad that you posted this! I'm definitely going to try to make one of these! It's beautiful!